Narayan led the OH delegation to 3rd in Spirit at Thursday’s GA.
From Thurs Day 4 (forgot about this too): There was a fun carnival called Circus Circus for the students during the Teachers’ Banquet. It included many bouncy houses and fun obstacle courses and other games. So, the last day of convention was today. A lot of awards, a lot of togas. I relaxed much of the day, did some reading. 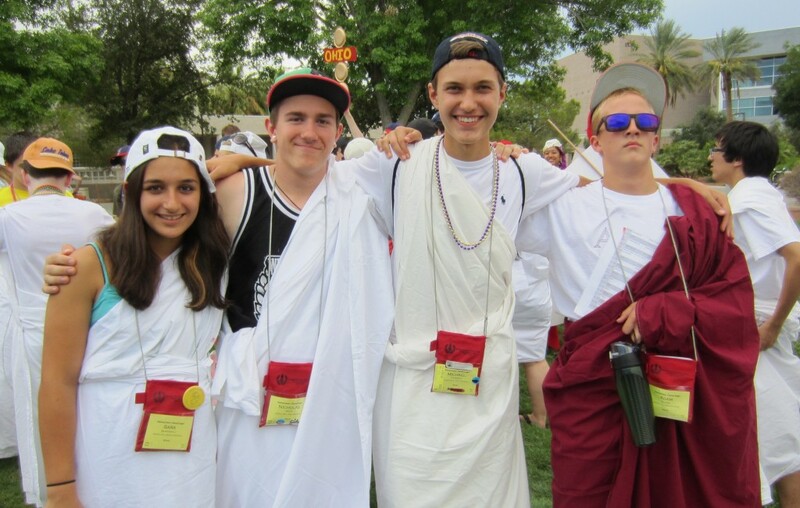 The certamen finals took place, but no OH teams, so no interest after watching so many rounds. 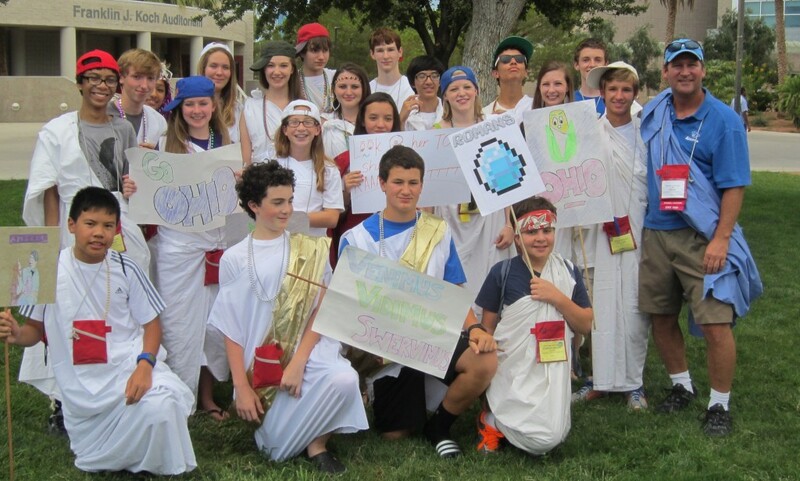 The toga parade was at 4 pm, the Ga at 4:30 pm, dinner at 6:30, World Series of Certamen at 7:30, fellowship at 11:45, rooms at 12:30 am. 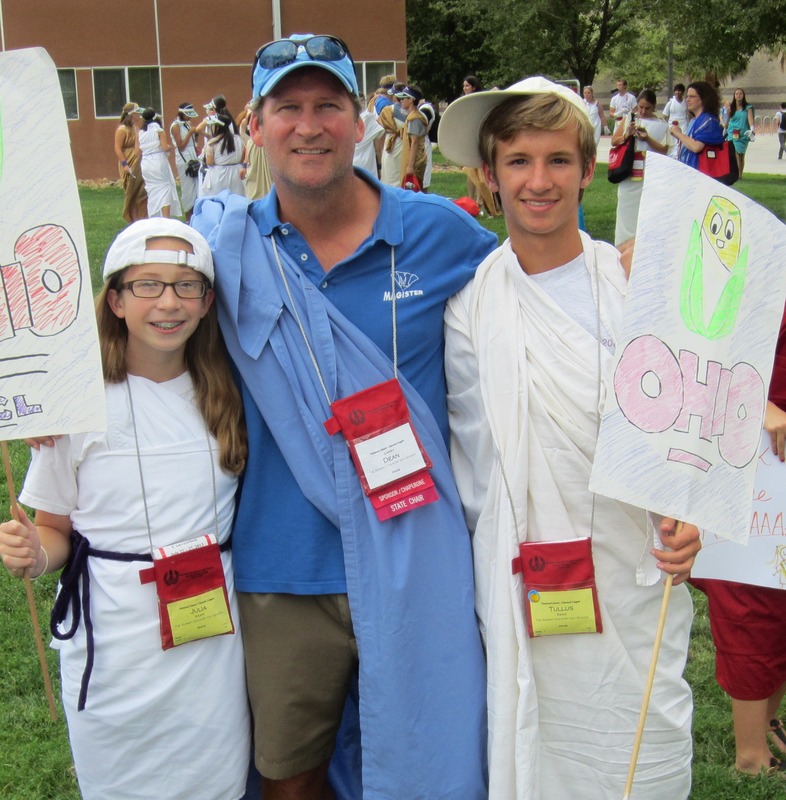 Click here for the start of the OH Toga Parade. 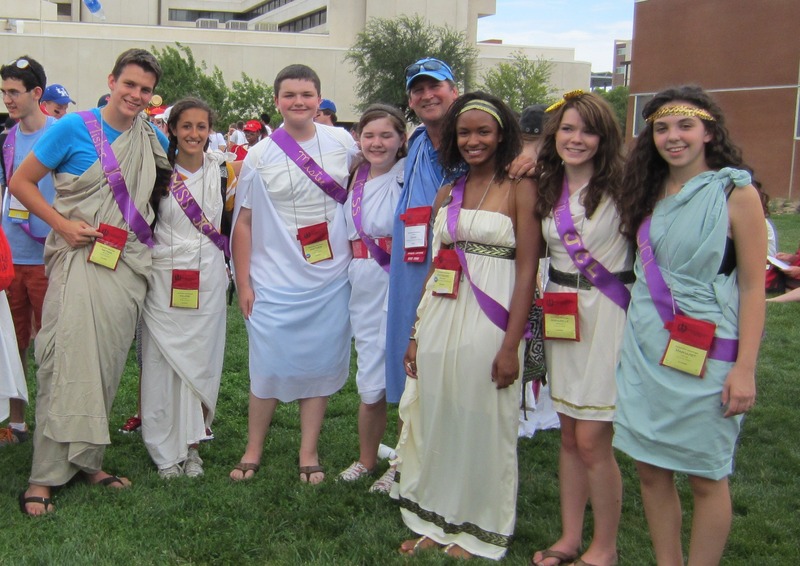 The final day always includes a toga parade, with each state walking along together. The pictures speak for themselves. I finally met up with the students of Lisa Mays, a Summit alumnus and Latin teacher at Elgin Academy (Chicago IL). Lisa is also an archaeologist and is presently at a dig in Greece. They were a very nice group and had nothing but glowing things to say about Lisa (of course!). 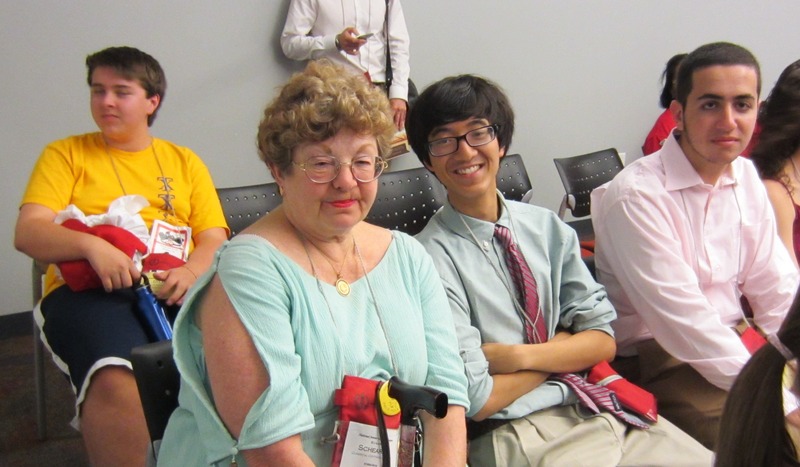 One of her students, Val, was on the Intermediate Certamen team that made the finals. Lisa has been following the blog and emailed that Val answered the question that won the Semis. She was clearly very proud and happy. So, Lisa, here is a picture and a video for you! Click here for my visit with the Elgin Academy (IL) kids, who have Lisa Mays’ (Summit alumna) as their teacher. 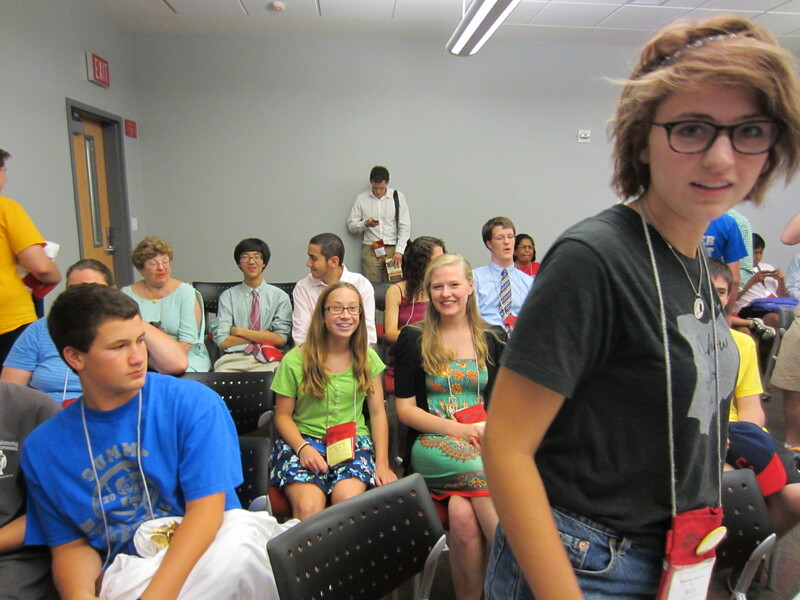 Bri Forney (Lakota West, OSU) was elected NSCL President. Melissa Burgess was re-elected Graphic Arts Chair on the NJCL Board, and Contest Chair Amy Elifrits was again appointed NJCL Committee Chair. The costume characters for next year’s OJCL and NJCL convention are: Helios for boys, Eos for girls, and Selene & Endymion for couples. OH won 2nd in Spirit during the Toga Parade. In Open Certamen, Michael Warden of Summit was on the 3rd place team in Novice, and Mo Patel of Lakota West was on the 1st place team in Advanced. In Competitive Certamen, the Intermediate team finished 7th, and the Advanced team finished 5th. Tim of Granville was the overall winner in Ludi Chess. In Overall Academic points, Connor Tomshack earned 10th, and Joseph Delamerced earned 8th. In Overall Creative Arts points, Hannah Barrett, Alex Might, and Alex Lathem finished 10th, and Allison Kao finished 9th. In Overall Graphic Arts points, Lindsay Dierig of Turpin earned 5th place. 3 OH students were honored for earning the highest score out of all 1,200 students at convention on an academic test: Narayan Sundararajan of Shaker (Ancient Geography), Tino Delamerced of Summit (Latin Derivatives), and Will Beatrez of St. Edward (Grammar, Level 2). The World Series of Certamen is for college students & teachers. Brian Compton and I are the perennial players on the Bad Larrys. This year, our young blood consisted of Tom Carroll (Westlake, Rice) and Sam Buck (Westlake, University of Chicago). We scored over 100 pts in both preliminary rounds and had a lot of fun. Tom was quick on the myth. Brian got the Dr. Who question involving TARDIS. And I got to do a little dance, as I followed the Latin command to ‘quate gluteas maximas.’ I apologized to Julia afterwards, but we got the pts. The semis was less fun and more serious, and we lost badly to Adam Williams’ team from VA & FL. It was all smiles during the prelims. Dance and karaoke filled out the rest of the night for the kids. Then fellowship. 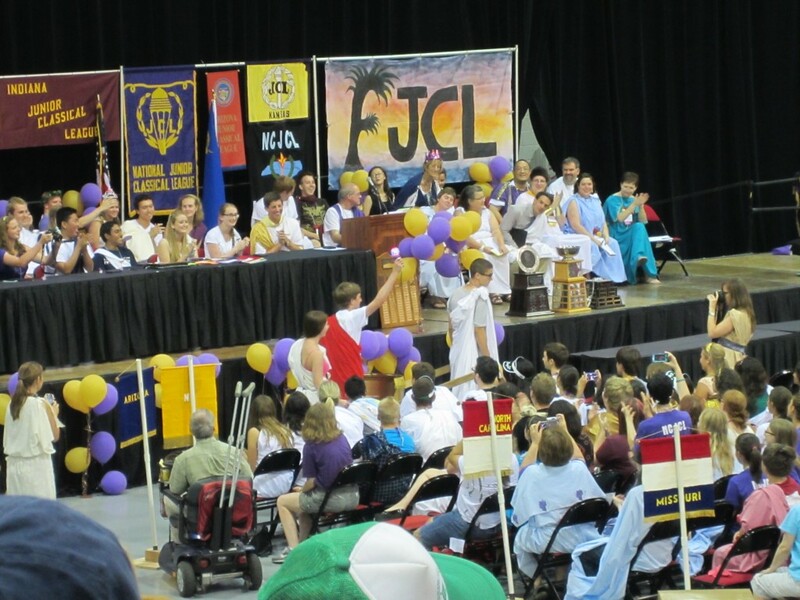 The recent graduates all expressed thanks to the delegation for some great JCL years. The bus will take us to the airport tomorrow at 11:30 for our 3:30 flight, then back in Cincinnati around midnight. The Torch is passed to the GA delegation for next year. 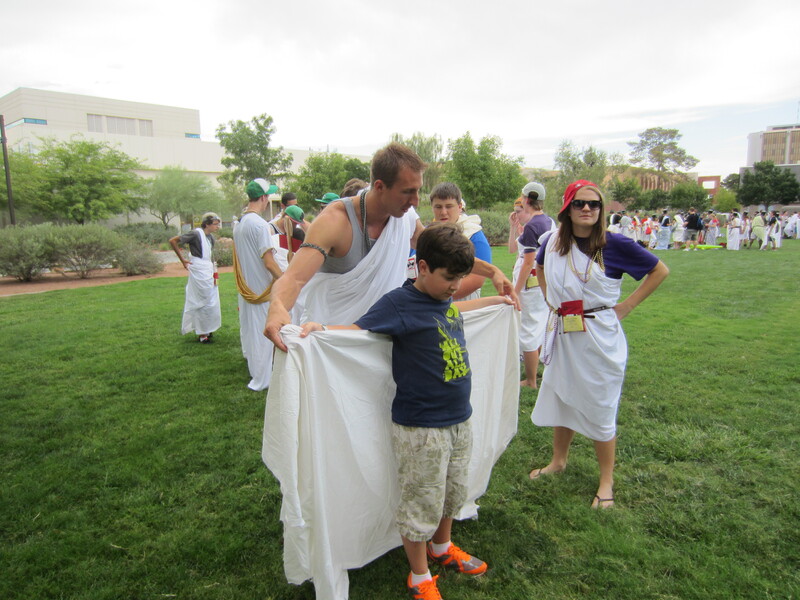 Greg Stemm, aka Prime, helps Christopher with his toga.